It seems Playtech is quite keen on slot games with an Oriental atmosphere. 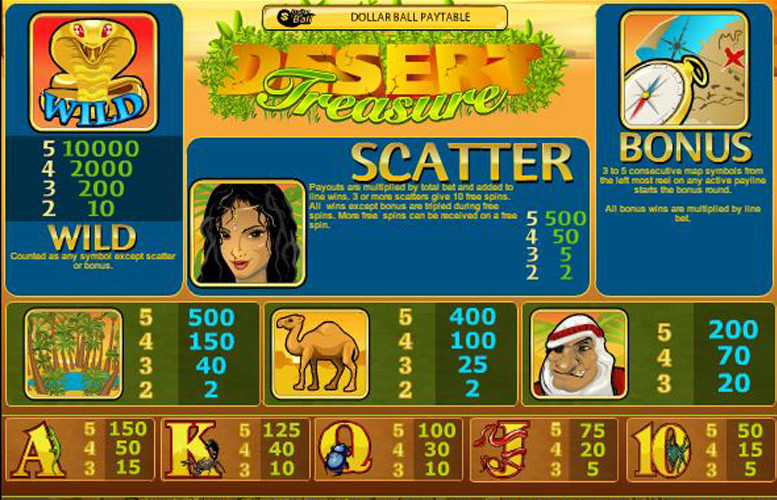 The Desert Treasure slot has an Arabian Nights theme, and joins the ranks of such games as the Cat Queen and Daring Dave. In our play-through, we’ve noticed that the slot has quite a high return for the player. Whether it’s just a stroke of luck for the reviewer or not, is up to you to find out. Here’s what you can expect. Graphic-wise the game feels very outdated, and the design choices are nothing to brag about. Then again, the slot is pretty old (11 years, in fact) – so we won’t hold it against it. The music is extremely eerie – are they sure they got the right track? It sounds more like something that would fit in a horror themed slot. 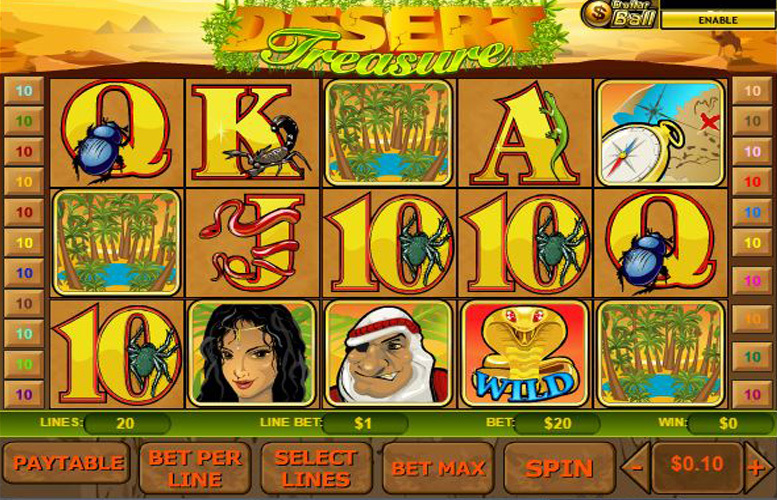 The maximum win on the Desert Treasure slot is 10,000 coins if you manage to land 5 Golden Cobra Wild symbols on a payline. Another feature that makes its return is the Dollar Ball. You can activate it by clicking the Dollar Ball button in the top-right corner of the screen. Essentially, how it works is that every time you place a real money bet, you contribute to the Jackpot pool. You choose five numbers, or let the game pick them for you. For every spin, a number will be displayed over your chosen numbers. If the numbers match, you win a prize. 4 matches gets you 1% of the Jackpot, and 5 gets you the big prize. Otherwise, the Arabian Princess Scatter offer the opportunity for 10 free spins if you land 3 of them on a payline. The good news is that you can re-trigger the free spins from within those 10 ones. Other games usually limit that feature, so this is a major plus in our book. Of course, the Princess also gives you an extra win if you land 2 of them anywhere on the reels. Very generous, indeed. Finally, landing 3 to 5 Map Bonus symbols activates a “pick-me” style bonus game. The kind Arab man from the symbol tells you to choose 3-5 options from his treasures. You can win up to $45 per treasure picked. We’ve noticed that the treasure chests usually contain the highest value prizes, but it could have been a mere coincidence. Very often, Playtech will add Poker card symbols (10s through Aces) to their games. They always seem to feel out of place, no matter what theme they choose for the game. The Desert Treasure slot is a different in that respect. Yes, they have Poker symbols, but at least this time the artwork includes various desert critters (scarabs, scorpions, snakes, lizards, and tarantulas). It adds a little bit of character to otherwise shoehorned symbols. Otherwise, you have the Oasis, Camel, and Arab symbols. They offer max wins of 500, 400, and 200 coins, respectively. Finally, there’s the extremely valuable Golden Cobra Wild, the elegant Arabian Princess Scatter, and the Map Bonus symbols. All these symbols contribute greatly to the fun factor of the game. Since they were already presented, let’s move on to the betting limits of the game. 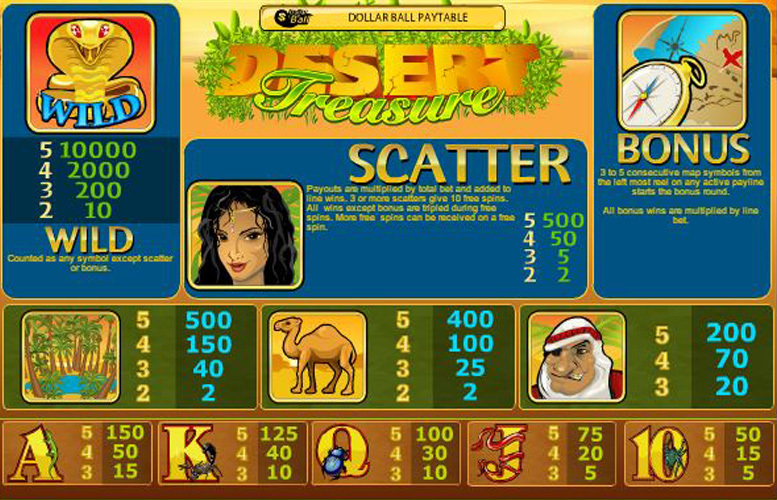 The coin values in the Desert Treasure slot are very standard, much like many others in the Playtech roster. They range from a $0.01 minimum to a $5 maximum. The line bet is multiplied by 10, however, so the max bet you can expect from this game is $1000. Considering the potential for a 10,000 coin Jackpot, we’d say this is sufficient for most players. The only good parts about the Desert Treasure slot seem to be its huge Jackpot, high paying bonus game, and the unusually good return on your bets. And maybe the Dollar Ball feature which we haven’t seen in a while from a Playtech game. The chance to win such a huge pooled prize definitely ups the value of the slot. After all, if you can’t offer a pleasing game experience, then you should at least give your players the chance to win big. Otherwise, you’re in for a pretty bland experience overall. The music in particular feels out of place and makes you wonder who approved it. It would probably fit in a Friday the 13th slot, though. It certainly doesn’t remind you of Arabian Nights. This game has a rating of 4 / 5 with 432 total reviews by the users.